Mary Tingey (later Mary Crisp, Mary Martin, and Mary Watling) was the oldest child of Robert Tingey and his wife Fanny Harrison of Canon Street, in Little Downham, Cambridgeshire, England. 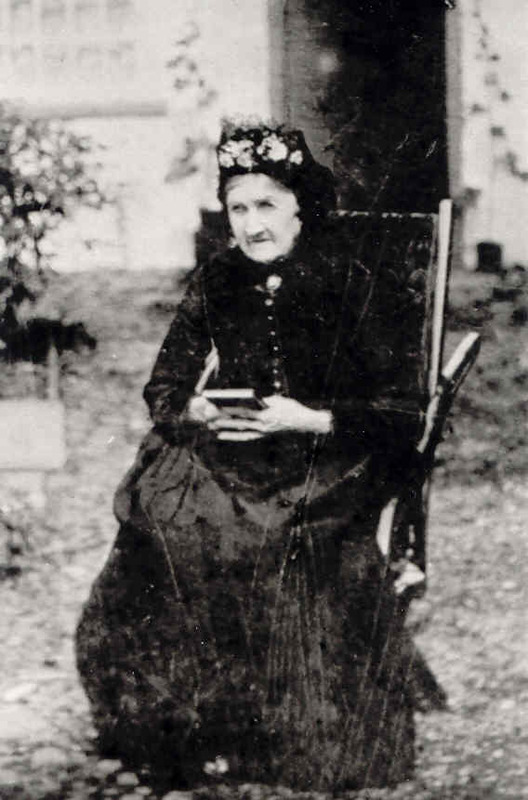 Above: Mary (née Tingey) in old age outside her home at the Railway House, Little Downham. Photo: Andrew Martin. Mary married John Crisp and together they had a son, William, but sadly John died not long after his son was born. By 1850, Mary had re-married to widower and railway labourer, James Martin. Together the couple settled down to have five children, although only one of these survived into adulthood - with two dying of scarlet fever, and two dying of tuberculosis. In 1868, Mary was widowed again, when James Martin was killed after being struck by passing trains, whilst working on the railway line near Little Downham. Mary appears on the 1871 census as a widow living at the Gatehouse at Second Drove, Little Downham, with her second son James Martin. In 1877, aged 57 years, she married 62 year old widower Matthew Watlington (although the couple appear as 'Watling' after this) and they lived at 100 Foot Bank, just North West of Little Downham until Matthew's death in June 1883. Just twenty days after Matthew's funeral on the 9th June 1883, Mary was buried too. circa 1820 in Little Downham, Cambridgeshire, England. 28th December 1823, aged 'about 2 years', with her younger brother William Tingey, at St. Leonard's Church, Little Downham, Cambridgeshire, England. John Crisp (1820-1847) on 23rd August 1846 at St. Leonard's Church, Little Downham, Cambridgeshire, England. James Martin (1814-1868) on 27th July 1850 at The Countess of Huntingdon's Chapel, Oxlode, Cambridgeshire, England. Matthew Watling (1813-1883) on 22nd October 1877 at St. Leonard's Church, Little Downham, Cambridgeshire, England. 1841: 20yrs, Oxlode, Cambridgeshire, England. 1851: 29yrs, 100 Foot Bank, Little Downham, Cambridgeshire, England. 1861: 41yrs, Second Drove Rail, Little Downham, Cambridgeshire, England. 1871: 49yrs, Gatehouse, Second Drove, Little Downham, Cambridgeshire, England. 1881: 60yrs, 100 Foot Bank, Little Downham, Cambridgeshire, England. 1871: Gatekeeper for Great Eastern Railway (GER) at Second Drove, Little Downham..
During June 1883 at Little Downham, Cambridgeshire, England. 29th June 1883, at Little Downham, Cambridgeshire, England.